Miranda: Days left? Til I stop taking orders from you? We're in the baby hat phase? Are you pregnant and you just didn't tell me? Permalink: We're in the baby hat phase? Are you pregnant and you just didn't tell me? It's a baby in a bag! Permalink: It's a baby in a bag! Maggie: Well, it's in our DNA. Permalink: Well, it's in our DNA. I'm not really a thinker. I'm a fixer, I'm not an innovator. Permalink: I'm not really a thinker. I'm a fixer, I'm not an innovator. Breaking up with you was a moment of clarity for me, and it hurts, but it hurts less than the alternative. I tried to convince myself that it was all just the tumor but apparently there is some fundamental part of you that can't love or be loved. Vincenzo: This woman of yours is beyond you. 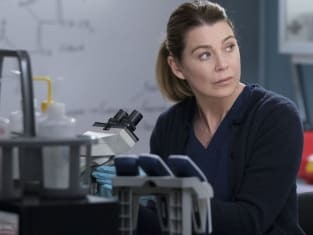 Vincenzo: Andrea even I have heard of Meredith Grey. Permalink: Andrea even I have heard of Meredith Grey. Richard: It's not a part of my story I"m particularly proud of. Maggie: It's the part of your story that culminates me and my existence, Richard. Permalink: It's the part of your story that culminates me and my existence, Richard. I can be auntie Amelia who is fundamentally incapable of love. Permalink: I can be auntie Amelia who is fundamentally incapable of love.